The Digital Civics Toolkit, built on research from the MacArthur Research Network on Youth and Participatory Politics, organizes resources for engaging youth in the civic potentials of digital life. As we come to the end of another school year, it’s often a moment to pause and imagine what new and innovative things we can experiment with next year. Given our interconnected lives and the many urgent and contested issues facing our world today, reconsidering how to prepare our students to participate in democracy and in society seems warranted. What skills, capacities, and dispositions do your students need to thoughtfully and productively navigate the world around them — and how might you support them in new ways? Of course, students often have many skills when it comes to using digital platforms and tools. But they may not feel confident about using them to learn about issues they care about, engage in productive online dialogue, voice their perspectives in powerful ways, and take informed action. 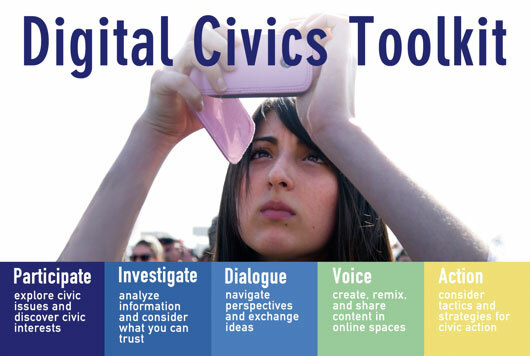 Enter the Digital Civics Toolkit. This new toolkit is a collection of resources for educators to support youth to explore, recognize, and take seriously the civic potentials of digital life. It draws on the research and work of the MacArthur Research Network on Youth and Participatory Politics (YPP). Participate—Students explore their identities and communities, identify civic issues that matter to them, and consider how they might use digital media for civic participation. Investigate—Students work to understand and analyze civic information online and consider what information they can trust. Dialogue—Students navigate diverse perspectives and exchange ideas about civic issues in our interconnected world. Voice—Students consider how, when, and to what end they can create, remix, and otherwise repurpose content that they share with others in online spaces. Action—Students consider a broad range of tactics and strategies for acting on civic issues. We invite you to explore the modules and choose the resources that best meet the interests and needs of your students, classroom, and community. Each module contains a conversation starter, several activities, and a closing reflection to support students to synthesize their learnings. If you’d like to dig deeper into concepts, there are also links to extension activities. For more information on the ideas in each module, we provide teacher background information with links to articles, blogs, videos, and further resources. We hope the Digital Civics Toolkit offers you engaging and relevant resources to explore over the summer as you plan and prepare for the coming school year. Let us know what you think in the comments below. To find out more about preparing youth for civics and politics in the digital age, watch this video. You can also visit the Educating for Democracy Deep Dive to find more videos, resources, and readings.